Blog Lights, camera, thank you…with a cherry on top! Lights, camera, thank you…with a cherry on top! Spring Break at The Family Center this year was full of activities and events, all hosted by our volunteers. 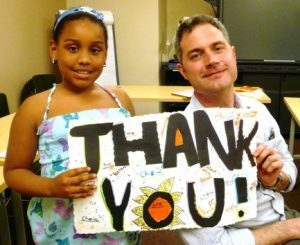 Independent artist Park McArthur, who was recently awarded a fellowship at the Whitney, conducted a three-day Gratitude Journals Workshop for our youth. Using an abundance of glitter, glue, and colorful markers, Park provided a creative, reflective, and fun environment for our children to explore the idea of thankfulness through discussion and artistic journals. At the end of the workshop, children and teens had the opportunity to present their Gratitude Journals to their caregivers, Buddy mentors and others in their lives for whom they are thankful. Bombastic, an entertainment branding company, also came on-site this week to film a short piece about The Family Center’s Just Buddies program. One of our Buddies, Emily Twomey, works for Bombastic and offered their creative services to help get the word out about our program. Mentors and mentees took their turn in the front of the camera, sharing their favorite Buddy experiences and the difference the program has made in their lives. 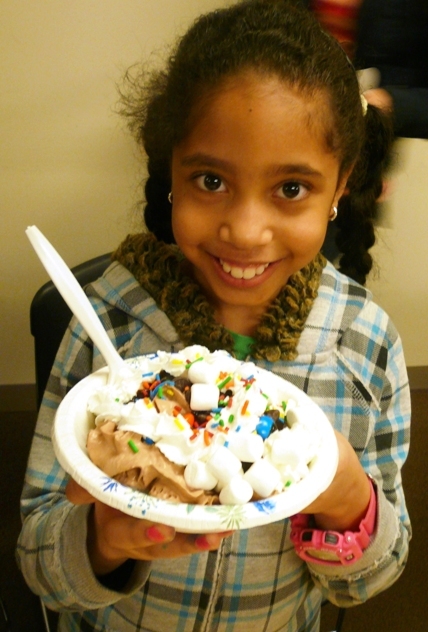 To top it all off, a group of volunteers from Linedata threw an Ice Cream Social for our children with a variety of flavors, toppings, and laughter to go along. When everyone had their fill of chocolate syrup and rainbow sprinkles, the group dared to take on our kids in games of Jenga, ConnectFour, and Checkers.